Admiralty Hostel i St. Petersburg, Russland: Bestill nå! 'Admiralty Hostel ' is a budget hostel situated in the heart of St Petersburg. 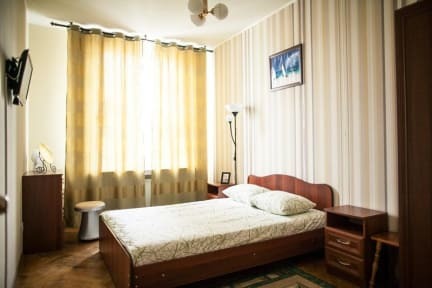 Its cozy rooms, friendly team and convenient location will make your holidays in the cultural capital of Russia completely unforgettable! 'Admiralty Hostel' contains 6 rooms: Twins (with two separate beds), Double rooms (with one bed for a couple), and Female Dorm. Twin and Double rooms are equipped by TV-sets. Breakfasts are not included, though there is a cozy and comfortable kitchen with a teapot, a microwave oven and all the necessary tableware, where our guests can cook for themselves breakfasts, dinners and suppers whenever they want. 'Admiralty Hostel' offers free Wi-Fi access, hair dryer and round-o'clock registration desk. We accept payments by credit cards and by PayPal.